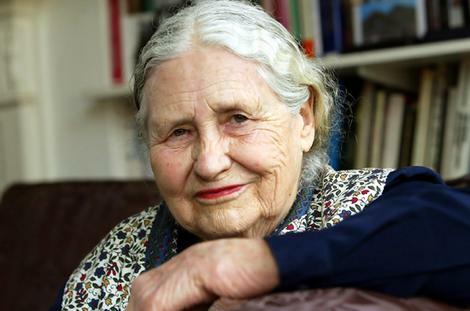 In case you missed it, the winner of the 2007 Nobel Prize for literature is Doris Lessing. She happens to be the oldest person to be awarded this honor and it is reasonable to ask, “What took the Nobel Committee so long? I was also interested to read an account of her appearance at a “Hay Festival” in the UK during the summer, before she won the prize. The reporter wrestles with Lessing’s demeanor and her views and, I think, does a good job of seeing through the ageist blinkers so favored by Western culture. Doris Lessing’s u-turns, evasions and apparent contradictions could be explained away as a sign of age, but I think she knew exactly what she was saying. Maybe it’s her age (87 last birthday), or her reputation (“Britain’s Greatest Living Author” etc), but Lessing does give the impression of not giving two hoots for the world’s opinion. Taking the stage at Hay, the old dame of English letters acknowledged the applause with a comically dismissive shrug. She then proceeded to dynamite pretty much every question that was lobbed her way. “That doesn’t make any sense,” she snapped at one adoring fan. “Explain yourself!” Later she sat with what appeared to be infinite patience through one particularly lengthy inquiry only to remark at the end that she actually hadn’t heard “a single word of it”.